>>> and violence in tunisia as that country in north africa swore in a new interim president. the long time leader was driven from power and fled to saudi arabia . today john ray of ourityn partner is in the capital tunis. >> reporter: if anyone is in control of tunisia tonight and it's a big if, it's the army. military helicopters are buzzing overhead. they're protecting government buildings and blocking off the main thoroughfares. but still these are dangerous and tense moments. after the chaos, the fragile calm in the capital imposed by the military but the dangers remain great with reports of squads of men firing at random from passing cars. they are believed to be supporters of the president who has fled the country. there has been widespread looting and some shop keepers have armed themselves with knives to protect their property. state television showed pictures of men arrested for raiding stores. they were forced to kneel in the streets and the weapons some were allegedly carrying were displayed for the camera. overnight police and troops were still rounding up people on the streets. one man was dragged away. it's not clear whether these were protesters or looters. amid all the tension, a jail in the holiday resort was set afire and dozens of inmates killed. tunisia now has an interim president and talks aimed at forming a coalition government that started with opposition leaders. but with troops on the streets and so much unrest still in the air, it may not be enough to end the wave of protests. the problem is many involved in drawing up the new reforms are the very same people closely associated, indeed, part of the old reviled regime. as far as the protesters are concerned they achieved what many thought was impossible, the ousting of pred ben ali . they i think will be in no mood for compromise. back to you, lester. >> john ray in tunisia tonight. 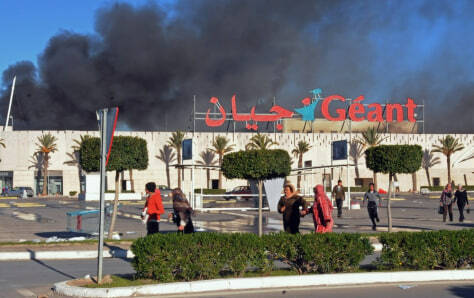 A supermarket in Bizerte, Tunisia, burns after it was sacked and looted on Saturday.